This collection contains the records of Daniel “Dan” Collins who served as Associate Director of Research in the Office of Communications from 1995-1996. 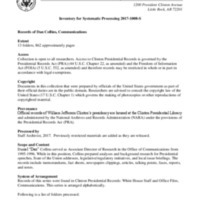 The collection consists of prepared analyses and background research for Presidential speeches, State of the Union addresses, legislative/regulatory initiatives, and local issue briefings. The records include memorandums, fact sheets, newspapers clippings, articles, talking points, faxes, reports, and notes.